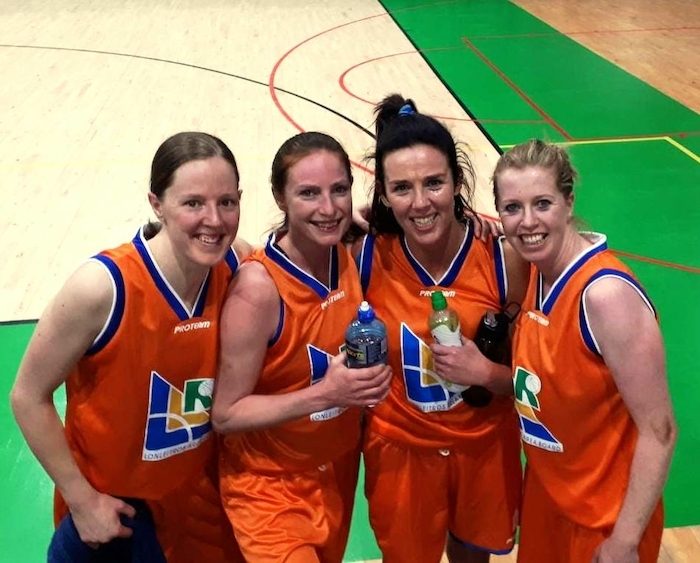 Mustangs claim silver in orange: Lorna Moran, Sinead Hughes, Karen Mulherin and Siobhan Kilkenny who lined out for the Lonleitros side in Tallaght last weekend. On Saturday last Mustangs went to do battle with fellow Lonleitros League players in the NAICs (National Area Intermediate Championships ) in the National Basketball Arena in Tallaght. Mustangs were represented by Siobhan Kilkenny, Sinead Hughes, Lorna Moran and Karen Mulherin. The remainder of the Lonleitros (LLR ) team was made up of players from Boyle Ladies, Longford Falcons and Western Warriors representatives. A maximum of four players from any one club could play for the representative team. The competition was played in a round robin fashion between the five leagues, which meant four games on the same day for the travelling ladies. First up, at 9.30am, was the game against Dublin Ladies and although the Lonleitros ladies did great battle, the new coach and new occasion of playing together meant that they had an immediate hill to climb against a team selected from the six division women’s basketball league in Dublin (45 teams ). It was a glut of three pointers from the Dublin side that left the final score on a disappointing 64-33, with Siobhan Kilkenny leading the Lonleitros charges on 13 points, followed by Lorna Moran on seven points. However, heads did not go down and in the next game against Kilkenny/South East team, the Lonleitros players had connected well and the score line finished on 40-19 to the Lonleitros side, with Kilkenny once again leading the scores on 15 points and top scorer for the game. Now, with two games played, the next challenge was against a physical Cork ladies side and the game finished 47-40 in favour of the Lonleitros side and Kilkenny once again top scoring on 15 points, whilst Lorna Moran contributed 10 points to the tally. The final game was against Midlands Area ladies representation and with two wins for Lonleitros and two wins for the Cork side, a win for the LLR side would secure the silver medal title on the day. With the battle that took place, you could see it meant a lot to both sides and only three points separated the teams at half time - 19-16 in favour of Lonleitros. The second half saw the LLR side dominate with impressive defence and super steals. The four Mustangs earned their stripes in this game with Mustangs making top three scorers in this game with Kilkenny on 20 points, Sinead Hughes on nine points and Lorna Moran on eight points. Mustangs’ next game is away to Warriors in Strokestown at 8pm tonight Friday, February 8.